When shopping for gluten free flour you need to look for those that come from a dedicated gluten free facility. The reason that it is so important with flours is because of the way that grains are processed. If you buy flours made in a regular facility, those gluten free grains will have a very high chance of being cross contaminated. The same equipment may be used to plant and harvest both grains. Wheat could be growing in the same field and be harvested along with the other grain. The mill storage area may have contained wheat or barley before. The processing equipment in a shared facility is unlikely to be free of gluten. Because of so many shared facilities, it is likely to be everywhere. For this reason, it is much more hazardous than a shared line in a packaging facility for other products that can be cleaned between batches. That is why only certified gluten free oats should be consumed by those with gluten sensitivity. There are a number of flours that can be used to substitute for wheat in baking and cooking on the gluten free diet. Many parts of the world use very little wheat. They are not as common as wheat though, and finding them can be a little difficult. The biggest challenge in substituting these flours for wheat in a recipe is that they behave very differently than wheat flour. No one type will have the exact same properties of stretch, rise, and binding that wheat has. Most mixes used in gluten free baking are combinations of flour and starches. Even then, usually a binder like Xanthan Gum or Guar Gum, or even gelatin is necessary to keep it from falling apart. Rice is probably the most common and easiest to find. 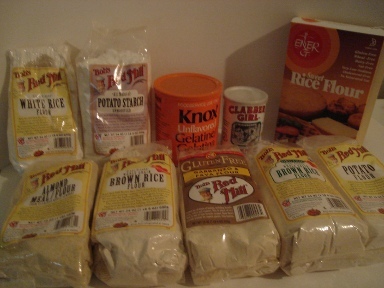 Several suppliers make rice flour. Bob's Red Mill has two facilities, but only one of them is a dedicated gluten free facility. In that facility they produce both white and brown rice flour. Arrowhead Mills, EnerG and several other companies also produce gluten free flours. All of these can be found at a Whole Foods, Wild Oats, or some Farmer's Markets like Sprout's. Trader Joe's also carries quite a few gluten free products. Some grocery stores are beginning to make a gluten free section, and these are the brands that they most often carry. Fry's/Kroger/Meyers carry them in some of their stores. If you can't find it anywhere else, you might want to order it online and have it shipped to you. If you make your own mix, you will need potato starch or corn starch or Arrowroot starch and tapioca flour. These are commonly added to the rice flour to lighten it. Be warned that rice flour is very gritty, especially the coarser grind usually available. For leavening you need gluten free yeast, like Red Star. Clabber Girl baking powder is gluten free. So the flours you may want to try are: white rice, brown rice, sweet rice, corn, amaranth, quinoa, teff, millet, sorghum, potato, and almond meal. Some people also use coconut, bean and chestnut. The flours you use will depend on the recipe you wish to make. You will need to follow a gluten free recipe to make things until you are familiar with the properties of the different types of flours and starches, and how various combinations interact. There are some recipes that focus on the more common varieties, and others that rely more heavily on bean and sorghum blends or the more exotic types, as they have higher nutrition. xanthan gum, guar gum, unflavored gelatin (Knox), potato starch, tapioca starch/flour, corn starch or arrowroot starch. Tapioca starch and flour are the same thing. 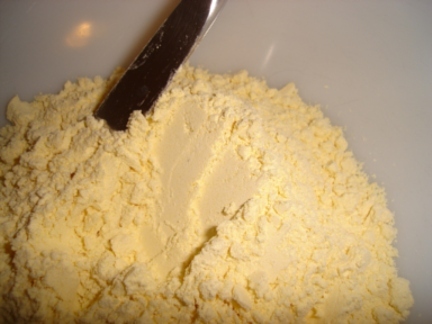 Potato starch is white and fine like corn starch, potato flour is darker and grainy looking. Below, Corn Flour, available at the Asian market and also made by Bob's Red Mill. If you are lucky enough to have an Asian market within driving distance you can find many of these flours much cheaper there. The Asian versions are ground much finer, and are less gritty. If you can get Indian Ladoo Besan by Laxmi or House of Spices, you will have a garbanzo/chickpea flour that is sweeter and better tasting. And much less expensive too. They call chickpea flour gram. I have not had any reactions to these flours myself. Note: There is still a risk of cross contamination with these flours. Laxmi does also produce wheat flour, but not very often. If you want to be sure of 100% gluten free flour you will need to buy those from dedicated gluten free facilities like Bob's Red Mill. They usually have rice, corn, black lentil, other beans, and the Jowar brand sorghum flour too. Sweet Rice Flour will be called Glutinous Rice Flour at the Asian market, but it does not contain gluten. It means sticky rice. It doesn't have the protein in wheat, barley, rye or oat gluten. So glutinous rice is perfectly safe on the gluten free diet. It has a better texture than regular rice flour, but is high on the glycemic index, so keep it a smaller portion of your gluten free flour mix.